The 10K is a grind. It's a race that can be run relatively fast when you consider that your per-mile pace for a 10K is fairly close to your 5K pace, making the 10K a tough distance. You're running relatively fast for 6.2 miles. While the first couple of miles will feel controlled, the race soon becomes a grind where you're not speeding up but instead feeling more and more uncomfortable. Before we go into detail about the race, let's be honest about what a difficult race it is to run well. If you're new to the distance, then the simplest way to approach the race is to divide it into two 5Ks. The goal is simple. Run the first 5K very, very easy. Then you can start your racing after that 5K mark is reached, running each mile a bit faster so that by the end of the 10K you're definitely at your max. More: 5K or 10K: Which Distance Should Beginners Run First? How easy should the first 5K be? You should be able to talk to someone in that first 5K. But things change in the second 5K, where you start to run a pace where you could only speak in short phrases to someone. During the last 800m of the race, you should run all out. For the more advanced runner who wants to have a good race and is a bit nervous about the distance, a simple plan of 1 mile comfortable, 4 miles steady, then 1.2 miles fast is a great way to run the distance. This plan assumes that you've run a 10K before. 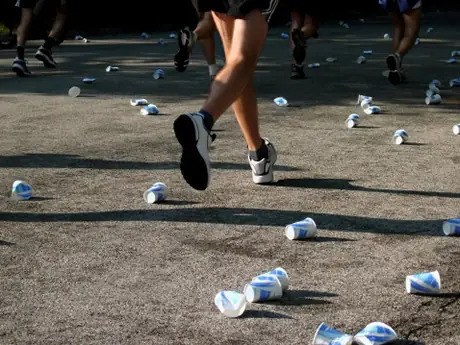 The first mile of this plan is really important, as so many runners go out too fast in the first five minutes of a race, and pay dearly for it at the end of the race as they suffer through the final miles. Think for a moment about what the start of a race looks and feels like. There's music blasting at the start line, you're shoulder to shoulder with total strangers, and everyone's awaiting the gun anxiously. There's a lot of hype at the start of a race, and it's important you don't get caught up in the excitement at the start of the race. When the gun goes off, make sure to run the comfortable pace that you've been practicing, and resist the urge to go out fast like everyone else. That's the reason you want the first mile comfortable—it allows all of the "crash-and-burn" runners to go out in front of you, allowing you to focus on your breathing and getting into a grove with your pace.